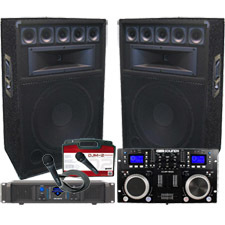 Complete DJ System - Everything you need at an awesome price! All you need to DJ at Weddings, Reunions, Partys, or even School Dances. 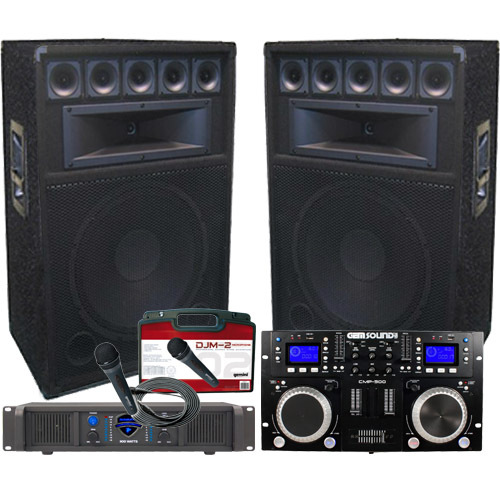 This package includes a Professional Dual CD Player / DJ Mixer Combo, DJ Microphone, 2200 Watt Amplifier, Two 12" DJ Speakers, and a cable to connect your computer or iPod. Awesome speaker for Karaoke or the Small Mobile Disk Jockey. The TR-120 has a 12" woofer with a high tempered voice coil, a horn and four bullet tweeters. Power rating 450 watts peak. This speaker has a professional carpet finish, steel corners and heavy duty corners. Everything you need in one rackmount unit. Gemini Sound's CDM-4000 is a Dual CD MP3 USB Player & music mixer in a single rackmount unit and packed with performance features. It combines a Gemini sound DJ mixer with a dual CD player. Features include Rotary tone controls ( high / mid / low ), CD, Mic and line inputs, headphone jack, Loop and reloop ( in & out ), 2 Channel RCA master output, 2 channel REC output, Photo Interrupter jog wheel and CUE on /off switch for each channel. Simply plug this unit into your home stereo or a set of powered speakers and your complete system is ready to go.